I first stumbled upon food blogs during my leave from graduate school with my newborn son back in 2006. For a gal who reads cookbooks to bed and dreams of new ways to experiment with food, it seemed like a perfect medium for exploring and documenting the hits and the misses of my kitchen. “Wait until you finish your oral exams,” I told myself. Half a year passed. “Wait until you write up your dissertation proposal.” Another six months came and went. With each milestone on my way to earning my PhD, not to mention the birth of my daughter in 2009, I delayed beginning this blog. This is not to say that I didn’t tell every one of my friends and family members all about the content, sidebars, and subcategories that I would showcase. Woulda, shoulda, coulda. Well seven years, a husband, and two children later, I finished my doctorate and I am taking a year to finally start things like this food blog that I have been imagining and planning for five years. Check back with me in a couple of months or so to see how this all pans out, but I imagine this blog representing several things. I will publish mostly original recipes from my home kitchen. I don’t ascribe to any one diet or food trend, but my meals tend to be inspired by food from nearby farmer’s markets, grown by Mariquita Farm (from whom we receive a “mystery box” of organic produce every other week), or from our own backyard. In other words, a largely vegetarian, local, and organic diet. This is not to say I don’t love a good smoked pulled pork (like my sister’s), Moroccan lamb, or bacon. Mmmmm. I just tend to enjoy vegetables and fruit the most. Oops. I meant vegetables, fruit, …..and chocolate. Yes. This blog will also feature a lot of sweet, decadent treats. If you came for lunch or dinner at my house, you would be fooled into thinking that you had supped on a healthy and balanced meal. Wrong. Wait for the last course please. Part of why I have named this blog la cuoca ciccia (“the chubby cook” in Italian) is because you will be treated to more dessert recipes than are reasonable for a healthy individual. I confess to consuming some sort of dessert twice a day. Every day. A final theme you will see relates to my own background. I have spent a good deal of time in Italy, living, studying, and visiting my relatives. My first passion for food unquestionably stems from my Italian roots. That being said, I am still a mutt. Much like my PhD work, which focused around the Mediterranean, I am particularly fanatical about the foods of Arab cultures as well. And a recipe? Ironically, I have had a really hard time figuring out what recipe to start my blog with. In the past few days, I made homemade crumpets, ciabatta bread, croissants, vanilla bean macarons, a Moroccan seven-vegetable couscous, an end-of-winter soup, an endive-butter lettuce salad with honey dressing, shaved pecorino, and toasted hazelnuts….but none of them seemed like the right way to begin. Instead, I give you my version of my dad’s banana bread recipe. I should start by saying that I categorically hate plain bananas. However, this bread is so fragrant, comforting, and special that I have come back to it and tinkered with it for years. 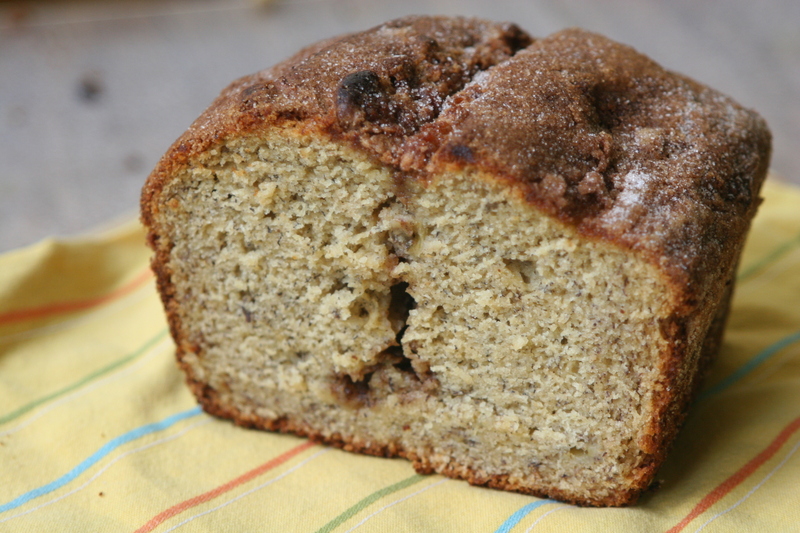 As with any banana bread, you do yourself a disservice to use yellow bananas. 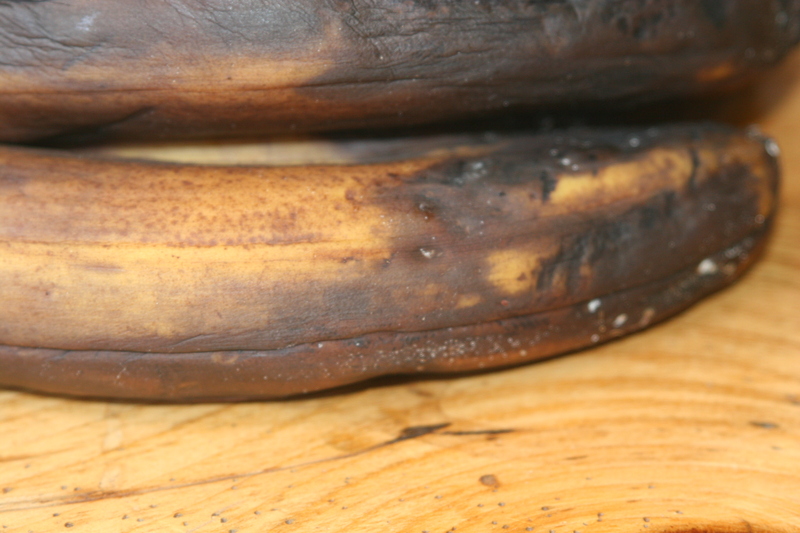 The bananas should have almost completely black skin (but not to the point that they have begun to shrivel). The key to making this have a tender crumb that doesn’t get mushy several days later (if it last more than a day in your house), is to use a mix of butter and olive oil. Yes, olive oil. I know that there are a couple of cakes out there that make use of olive oil as the primary fat (including one of my favorites), but it makes this banana bread taste mysterious. The other special touch, one that I credit my father with, is the gooey cinnamon center of the bread. Each slice you cut has a crevice of sticky, spicy cinnamon that keeps the inside of the bread moist and fabulous. As for the spice blend, I continue to play around with it and have tried cardamom, chinese five-spice, and as in this instance toasted, ground anise seed. Let me know what combination you try. Finally, do toast the slices the next day with a generous slice of fabulous salted butter (I love Irish butter, or cultured). It’s wonderful with your morning coffee or tea. Thanks family and friends for your encouragement to finally start this. 1. Preheat the oven to 350 and grease a loaf pan with cooking spray, olive oil, or butter. 2. Cream the olive oil and butter in a stand mixer or Cuisinart mixer. 3. Add the sugar and beat until fluffy. 4. Add the eggs one at a time, scraping down in between additions. 5. Add the mashed bananas and mix until just incorporated. 6. Add all the dry ingredients except topping and mix until just incorporated. 7. If using, add walnuts. 8. Pour batter into prepared, greased loaf pan and flatten with rubber spatula. 9. Sprinkle about a third to a half of the cinnamon-sugar mix in a straight line down the middle of the pan, lengthwise and then push deep into the batter, all the way down the line. 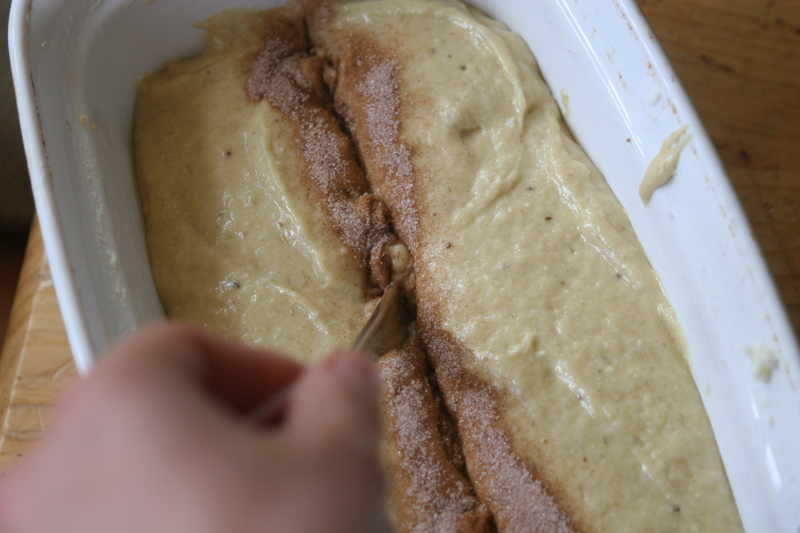 Sprinkle the remaining cinnamon-sugar over the rest of the batter. 10. Cook for about 45-55 minutes, turning 180 degrees halfway through the cooking time until a skewer or toothpick inserted comes out clean. 11. Turn out carefully onto a rack to cool (cinnamon-sugar will spill a little, that’s fine). Notes: I really like the round flavors from the whole wheat flours and the bitter touch from the quinoa flour. You absolutely can make this with just unbleached all-purpose flour. Just use two cups. Alternatively, you could use 1 scant cup plain whole wheat flour and 1 cup all-purpose flour or if you love whole wheat pastry flour you can just use that too (also two cups). This entry was posted in Breads, Breakfast, Dessert, Whole Grains and tagged baking, banana bread, cinnamon olive oil banana bread, whole grain flours. Bookmark the permalink. 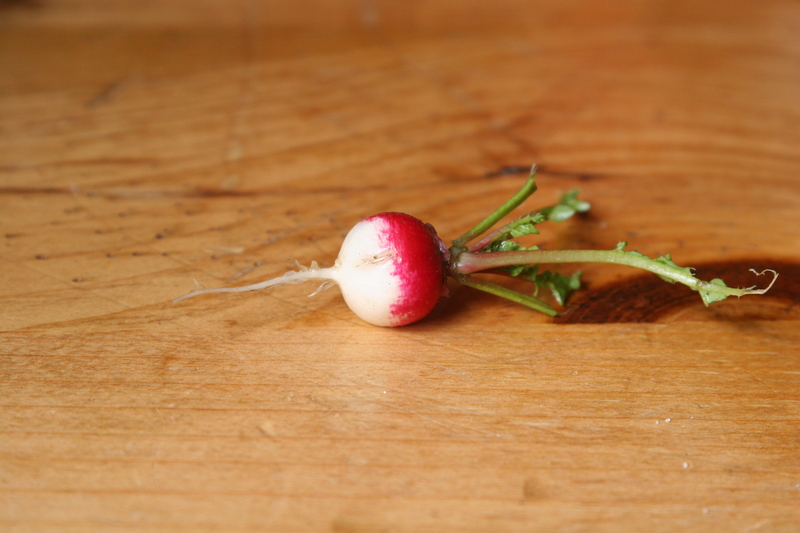 19 Responses to Food Blogging in My Dreams Since 2006…. Yeah!! !…Congratulations, Anne Marie. I am a follower! Brava, my dearest and favorite cuoca! And hooray for me and all your other eager-to-become-regular-readers; I cannot sufficiently express how excited I am to watch — and taste! — as this dream of yours unfolds. I(/we, cf. above) have been waiting, drooling, for nearly as long as you have been imaging this blog into shape. Thanks guys! I’m really excited. What a beautiful blog, Anne Marie! Congratulations on this exciting project! Fabulous first entry! Looking forward to many more, but I will have to remember to read them during the daytime because its 11pm in Tennessee and I am salivating, looking for something to eat around the apartment. Oh well… keep ’em coming! Can’t wait to try this recipe. Congrats on the new blog! hello! saw you as a link to my own blog. welcome to the world of food blogging!! your recipe looks delicious; i look forward to seeing more of your creations! I am not only a subscriber but also a taster and I just love it!!!!! I’m delighted you found my blog. Let me know how the banana bread goes and if you have any favorite versions.